We’d love your help. 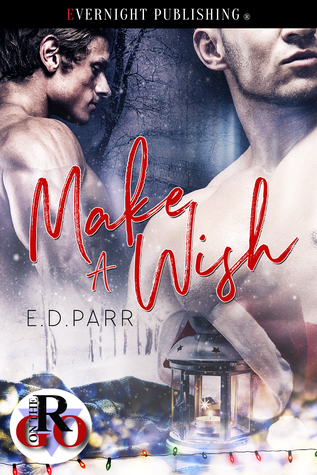 Let us know what’s wrong with this preview of Make a Wish by E.D. Parr. It’s the day before Christmas Eve and gorgeous, happy, Nick Kringle is making deliveries on the main street of the city when a car breaks down at the intersection. Amid the seasonal crowds and inclement weather, Dylan West gets out of his car and tries to push it to the side of the road. Nick rushes to help him and comes face to face with the most delicious man he’s ever se It’s the day before Christmas Eve and gorgeous, happy, Nick Kringle is making deliveries on the main street of the city when a car breaks down at the intersection. Amid the seasonal crowds and inclement weather, Dylan West gets out of his car and tries to push it to the side of the road. Nick rushes to help him and comes face to face with the most delicious man he’s ever seen. Dylan’s down on his luck, but Nick believes in magic. To ask other readers questions about Make a Wish, please sign up. A touch of magic is just what Dylan needs in his life: he is out of a job, has no real friends, and wants someone to love who can love him back. Nick Kringle may have a job and a loving family, but he is lonely too. So when Nick finds Dylan stranded with a broken-down car, he decides to help. Dylan has had a very tough year. His best friend turned out to be a criminal, then shot Dylan, and he has been trying to recover ever since. He can’t even seem to find a job so when his car breaks down on hi A touch of magic is just what Dylan needs in his life: he is out of a job, has no real friends, and wants someone to love who can love him back. Nick Kringle may have a job and a loving family, but he is lonely too. So when Nick finds Dylan stranded with a broken-down car, he decides to help. Dylan has had a very tough year. His best friend turned out to be a criminal, then shot Dylan, and he has been trying to recover ever since. He can’t even seem to find a job so when his car breaks down on his way to an interview, Dylan isn’t even all that shocked. Nick has a much more optimistic attitude, but he has a supportive family and a great job. One look at Dylan is enough for him to decide that he needs to get to know him better. One thing quickly leads to another, and – as is tradition in Nick’s family – wishes start coming true as if on their own accord. If you like Christmas stories with lots of magic and sweetness, then you may like this short story. Nothing better than a insta-love quickie at Christmas and this was a little bundle of Christmas joy. A great mm holiday romance, that can be read anytime. It sizzles with sexual tension and will heat up your holiday.